Bill and I went for a day of snowshoeing from our cabin in Chickaloon up towards Castle Mountain which is about a 15 mile RT and over 2000 feet in elevation. We follow a horse trail and then a rodd for a mile, the rest of the way is a muddy summer trail, it was pretty good since at least one snowmachine had been on it. At the top there is an old hunter's cabin on a ridge but protected by alder bushes.Otherwise it would have been toughbraking trail from the old mining road another 3 miles of deep unbroken snow. The day couldn't have been more beautiful. I spent most of the time looking for animal tracks and taking lots of pictures. You sure wouldn't have to starve around here, lots of bunnies. We actually saw one, they are hard to spot since their winter coat is white. We saw a set of wolf tracks on the mountain the other day. We also found two moose beds where they felt pretty safe and had a pretty good view of their surroundings. We had started at noon and got back just when there was alpenglow on Castle Mountain. 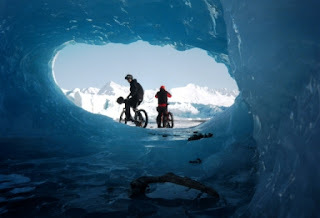 Bill and I are headed to Willow on Saturday for the Willow Winter Carnival bike race and hope to ride there for a couple of days and ride up the Yentna River. It has warmed up in Southcentral Alaska. Palmer and Wasilla received some significant amount of rain last night. Chickaloon stayed below freezing and this morning we had 3 inches of fresh snow! We had to run some errands in town ( Palmer/Wasilla) and what a mess on the streets it was there. I could hardly wait to get back to Chickaloon to our beautiful winter wonderland. Amazing we are just a little higher here and further up the Matanuska Valley and such a different weather system. At this hour (10:00PM) it is still 44 F in Palmer. 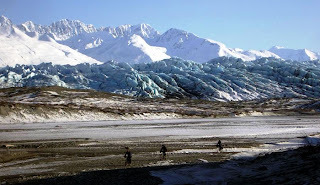 Those winds from Prince William Sound bring that warm air down the Knik River valley. It is 28 F here in Chickaloon and a pretty moon reflecting in our fresh snow here. Word from Denali Flying Service in Willow was that there were 2 feet of fresh snow at Shell Lake and a foot and half on the Yentna River. 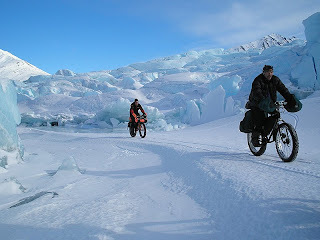 With these warm temps the trails out of Knik and Point McKenzie should set up good. By Thursday there is a cooling trend in the forecast for Southcentral. 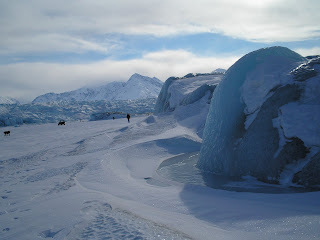 Here are some more pictures from past years at the Knik Glacier. Hopefully we get to ride out there soon. Bill and I rode from Point McKenzie to Flathorn Lake and up the trail across the Dismal Swamp and on all the way up the Yentna River to Luce's. The trail is in great shape all the way right now with some softer sections on the river and less snow than usual for this time of the year. The Knik 200 sled dog race had started the day before and we met some of the last teams in the race returning to Knik. We enjoyed a burger at Luce's and after spending the night we headed back down the trail to Point McKenzie early at dawn. 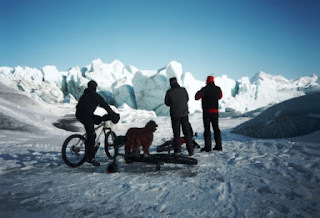 On the Susitna River we saw two wolves in a distance on the jumbled up ice. 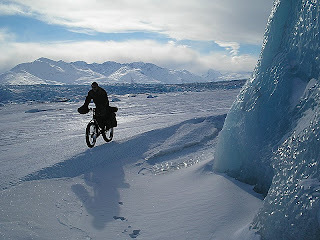 This year the rivers froze more jumbled than other years, it is fun to ride through it on a bike. Looking at some of the tracks that some of the mushers had left behind jumping off ice ridges, I don't think they enjoyed it quite as much as I did. 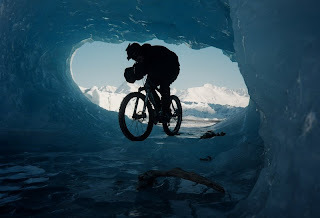 By the time we got to Flathorn Lake we got into a snow swirl for a while pushing across the lake since I thought I wanted to push the bike some so I wouldn't forget what that was like. The trails have just been too good for biking so far. 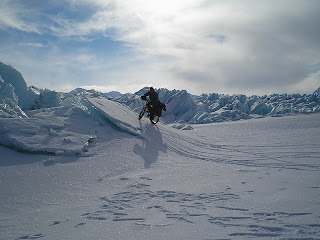 In 2006 I pushed my bike pretty much from Puntilla to McGrath, 170 miles. 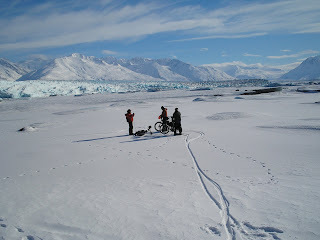 The year before I estimated that we had only pushed the bikes for 30 or 40 miles. That was on Snowcat rims with the Geax Sedona tires, now I have a Fatbike with bigger rims and tires. I have really enjoyed having the bigger tires, I can ride softer trails. There was one spot on the Susitna River where the trail had fallen in and our tracks from the day before had disappeared. 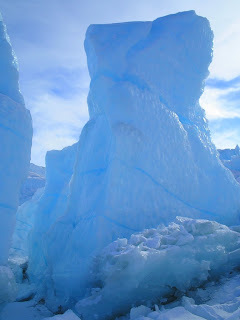 The river was blocked off and flagged, now there was only an 18 inch wide ice bridge of trail left to cross. Dave Luce said that he sees the first snowmachiners usually by mid November. This year the rivers froze much later and nobody traveled on the rivers until mid December. Every time we go out on the trail it is like a new place and I could never get tired of it. The morning light out there on the river was special, in the race it has been dark both times on that section of trail, I didn't get to see much. Now I know the river section isn't quite as monotonous and boring as I thought.